While Fort Air Partnership Board members and other officials look on, Chair Keith Purves and Executive Director Nadine Blaney cut the ribbon officially opening the new Gibbons Air Monitoring Station. They are assisted by Gibbons Deputy Mayor Louise Bauder (left centre, in red) and Colin Piquette, MLA, Athabasca-Sturgeon-Redwater. 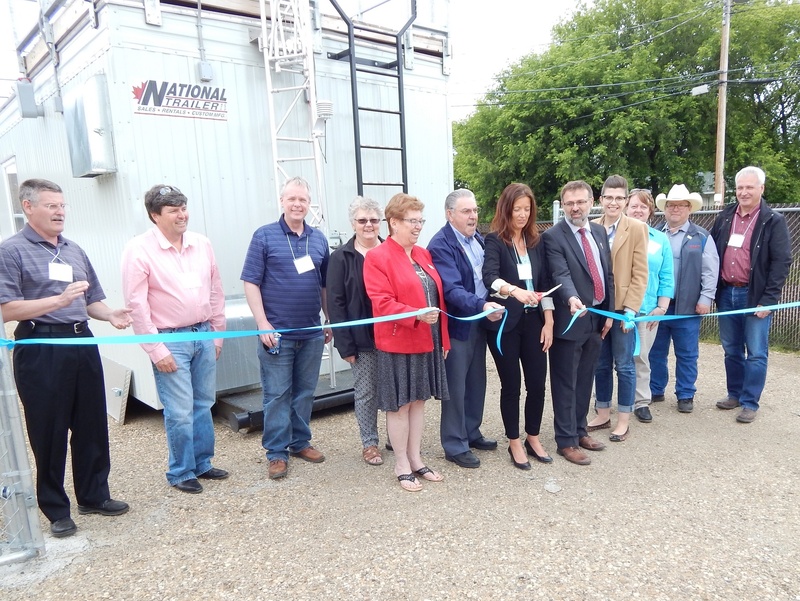 Local residents, dignitaries and Fort Air Partnership (FAP) members gathered in the sunshine June 16 to celebrate the opening of FAP’s newest continuous air monitoring station in Gibbons. 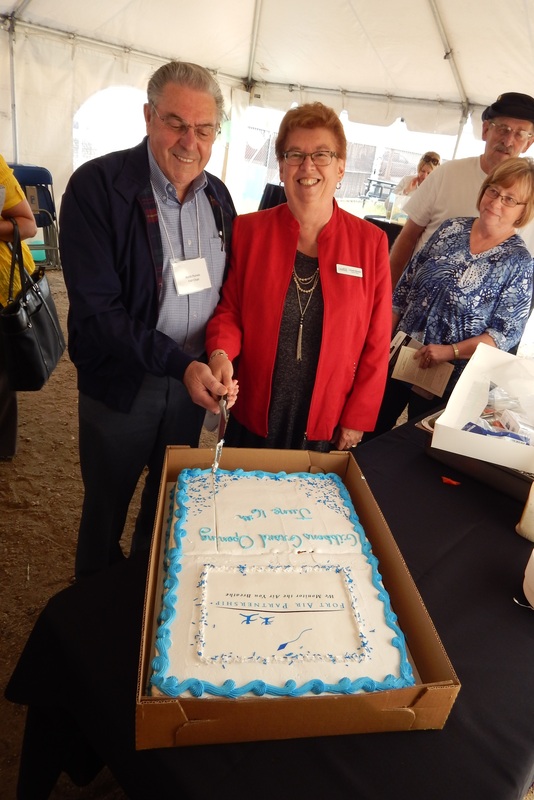 A ribbon cutting and cake followed speeches by town and provincial elected officials, and an official opening address by FAP Chair Keith Purves. “This station at Gibbons is a positive addition to our network. We look forward to having greater involvement with residents in this community,” said Purves. He explained that the Gibbons station is part of a national information network and that station data enables a current and forecast Air Quality Health Index (AQHI) to be calculated for Gibbons. The Gibbons station is located just south of the Town of Gibbon’s administration building at 50 Avenue and 48 Street and was activated in February. The station monitors and collects data on seven substances (sulphur dioxide, hydrogen sulphide, nitric oxide, nitrogen dioxide, ozone, oxides of nitrogen and particulate matter) as well as weather information. The public can view a near real time live date feed for any substance tracked by the Gibbons station, or any of FAP’s other continuous air monitoring stations. North West Redwater Partnership provided funds for the purchase of the Gibbons station and the first year of operation. The station’s on-going operation will be funded by the Northeast Capital Industrial Association, of which North West Redwater Partnership is a member. The Government of Alberta provided a particulate matter analyzer to enable AQHI calculations. The grand opening of the new Gibbons Air Monitoring Station included school tours on June 15. 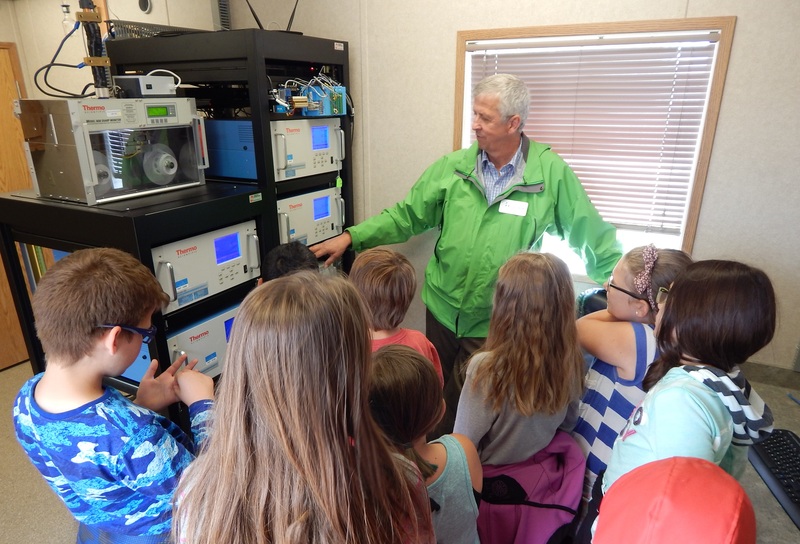 Here, Network Manager Harry Benders shows the station’s analyzers to Grade 4 students from Landing Trail school. Gibbons Deputy Mayor Louise Bauder helps Fort Air Partnership Chair Keith Purves cut the cake marking the grand opening of the new Gibbons Air Monitoring Station. Recent forest fire smoke causing moderate to high Air Quality Health Index (AQHI) levels has emphasized the importance of having clean air to breathe. Clean Air Day June 8 is a good time to reflect on the value of clean air and individual activities that impact air quality. Fort Air Partnership is encouraging residents to support Clean Air Day by walking, cycling, rollerblading, carpooling or taking public transit to work, school or leisure activities. “Local air quality is good almost all of the time but Clean Air Day gives us a chance to think about the steps we can all take to help maintain the quality of that air,” noted Network Manager Harry Benders. Benders points out Fort Air Partnership continuously monitors and reports on air quality in and around the Industrial Heartland. This information, along with a daily and forecast AQHI, is available to the public on Fort Air Partnership’s website. The AQHI provides people with a way to gauge the quality of outdoor air, and adjust their level of outdoor activity accordingly.